The first time I heard the phrase “flexitarian” I gave a derisive snort. It was not as dramatic a reaction as the one I gave the first time I heard the phrase "pescatarian,” but still: it was in the ballpark. Are we all so desperate for distinction that we’ll give ourselves fancy labels at the drop of any hat? Imagine my surprise, then, when I learned that not only was the whole flexitarian thing grounded in some fairly solid ideas, I was actually one myself and had been for years. Who knew? Well, for starters, Nettie Cronish and Pat Crocker, authors of Everyday Flexitarian (Whitecap Books) know that it’s something a lot of us are thinking about. The truth is, a lot of people eat meat and would have a hard time removing it from their diets completely. Awareness is growing, however, and many meat eaters are mindful of where and how their meat is raised. In addition, there is a growing number of people who are eating more vegetarian meals because they recognize the health and environmental benefits. And that’s really a lot of us, isn’t it? Going completely vegetarian would just be more trouble than it’s worth, but we’re thinking more about things now -- holistic things. And the thoughtfulness makes us move ahead more slowly. Not only that, but we have more options than our forebears did. Even to cut down on your meat consumption 50 years ago would have been much more difficult than it is now. With all the gorgeous grains, fancy legumes and amazing cheeses available to almost everyone in every area of North America these days, it’s easy to make non-meat-based choices when it comes to meals. If we take all that as given, then Everyday Flexitarian is really not a specialty cookbook at all. It really reads as though it’s meant to be a very thorough yet basic guide to simple whole foods… without a lot of meat. The book is filled with lots of good, solid basics as might be enjoyed by a modern family. In addition, there is advice about stocking a mindful pantry and lots of hints to working with certain types of food. While much of the food here is both easy to prepare and throughly delicious, there is slightly too much emphasis on health for my tastes; not quite enough on good for good’s sake. For instance, I can’t imagine the world where Eggplant Manicotti is a good idea and the very thought of barley in a split pea soup troubles me unreasonably. And lentils on a pizza? Honestly: I don’t need protein that badly. No one does. That said, there are many more terrific combinations than dodgy ones. I particularly loved the Sweet Potato, Fennel and Apple Salad, a terrifically easy salad that comes together with a surprisingly vivid flavor. The Vegetable Shepherd’s Pie was very good, and very straight-forward, though pairing it as they did with lamb kabobs seemed a bit silly. After all, if you’re going to pair it with meat, why not just put the meat in the pie and be done with it? (I opted to just have a little bit more of the wonderful pie.) For me a really winning though surprising combination were the Ancho Chile Cranberry Brownies: moist and the flavor held a sharp edge with an undertone of spice. Delicious! 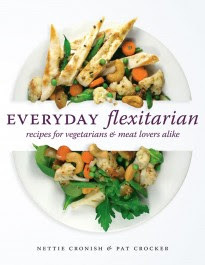 Overall Everyday Flexitarian is a very good book. Well produced and packed with inviting photographs and -- most importantly of all -- new ideas. Funny how important a name is. "Flexitarian" seems to lend a reality and even cachet to what what would otherwise be: "Uh,I'm not any of those other things." I think the reason that the put the lamb kabobs on the side of the shepherd's pie is so that if you are serving a mixed group of vegetarians and meat eaters, everyone can have what they want.